The United States features the broadest of churches in terms of political views. European critics have taken issue, historically, with its crude commercialism, a seemingly entrenched philistinism that tends to characterise imperial politics. Ancient Rome, after all, was not much better, as the days of glory waned, so did the calibre of politician. Which takes us to Wisconsin, where Governor Scott Walker has proven to be quite a headline maker of late. He is even bubbling up the ranks as a possible GOP contender for the White House, though such early pitching is bound to end badly. Name them early, and slay them later. For all of that, his focus remains on Wisconsin, a state he has been seeking to transform, and impair, in his own image. The nature of Walker’s conduct prior to his governorship, with its imperial overtones, is worth noting. As Milwaukee Count executive, his staff oversaw a clandestine email system, and created a “secret wireless router in Walker’s government office that commingled government and campaign business on private Gmail and Yahoo email accounts” (The Daily Beast, Mar 4). In January 2012, two staffers who had been with Walker during his county executive days were charged with doing political work while being funded by that good old creature known as the taxpayer. 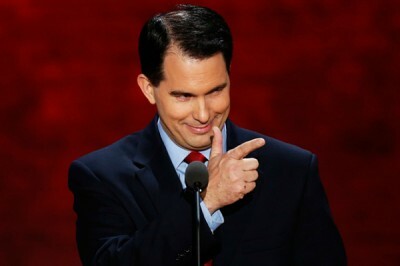 But the decay in the workplace under Walker seemed extensive. One of the clandestine website webmasters, Brian Pierick, was convicted for enticing a minor while Timothy Russell received two years for pilfering from a veterans group and swanning about on funded trips to the Caribbean and Hawaii. Before this fetid scenario, Walker took out the washbasin and began cleansing his hands – vigorously. “Scott Walker expected everyone to follow the law and made that clear publicly and privately.” But “Team Walker” suggests that the secrecy strain in certain political figures prove hard to hide. Such behaviour on the workplace provides a window, even if a little smudged, into the character behind such an environment. A state within a state will find threats everywhere, spawning like frenetically charged bacteria. Little should be surprising, then, about Walker’s latest foray into the populist world of anti-union slander. In the United States, the unionised worker is devil and fiend, the scrutineering counter against rampant capital. The Wisconsin governor certainly thinks so, and his statements pertaining to that express an acceptable perversion of American politics. It also provides the backdrop for the anti-worker legislation being debated in the Wisconsin assembly that would prohibit employees from a requirement that they join a union or pay dues under union contracts. This “right to work” measure is copied, almost word for word, from the American Legislative Exchange Council’s model. It is bound to pass comfortably. Phil Neuenfeldt, President of the Wisconsin AFL-CIO, could merely state the obvious fact obscured by such calculated lunacy. Such hysterically bizarre conduct on Walker’s part do not show the punishments of a confused mind. They show, rather, a disturbing creature in training, readying himself for a harsh, cruel stint in higher office, one filled with union bashing and smothering. Those wanting him to fall flat on his face will be hoping for more stumbles. The fear, rather, will be whether “Walker derangement syndrome” will earn votes rather than demerit points.